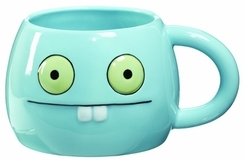 This colorful Babo mug is based on the collectible award-winning Uglydoll plush character. Created in Babo's loveable likeness this 10-ounce capacity ceramic mug measures 2-3/4 by 5-1/8 by 4-inch and comes in an attractive gift box. Mug is dishwasher safe; wash before using. Having a bad day? Someone giving you a hard time? Babo's got your back. What Babo lacks in mind power he makes up for in love. He's everybody's best friend. He will stick with you to the end. Mug is also available in other characters. Designed by Uglydoll - pretty ugly.